The VIDC Team is growing! The more people we reach, the more staff we need to continue to provide the same quality care to everyone. As such, we welcome our new HCV Clinical Research Nurse, Yashna Bhutani RN BSN. Our new Clinical Research Nurse, Yashna Bhutani. To introduce her to all of you, we did a brief — but insightful — interview with her and here are excerpts from that interview. Everyone, here is Yashna Bhutani. Let’s start with a generic question, tell us about yourself. Y: I have been a science geek for as long as I can remember! What drives me each day is being able to learn new knowledge and keep challenging myself with a new task, goal or mission. I have always been extremely fascinated about learning and gaining more knowledge in various avenues and fields, whether it is an educational subject, or related to general knowledge in nutrition and fitness, or learning about the art of wine-making or the different styles of dances. I am especially passionate about health care; I feel that there’s never a dull day in the field of health care and science. Providing patient care and thriving to take on a leadership role in the health care system is what drives my passion. 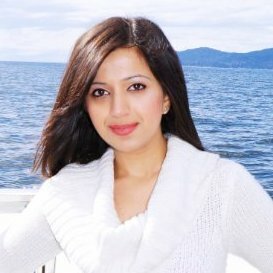 After spending undergraduate years in UBC studying microbiology, immunology and psychology, I realized that the field of nursing would suit my interest in providing direct patient care, so I decided to pursue my BSc in Nursing at BCIT, which was one of the best decisions I have ever made. I have had the privilege to work in surgical and medical units at Richmond Hospital and the Acquired Brain Injury Unit at GF Strong Rehab Center, both of which have allowed me to gain a copious amount of knowledge and develop various strengths in the field of nursing. I hope to continue persevering towards my aspirations in the field of health care and continue to tackle different challenges to reach new heights in my career and the health care field. How did you first learn about VIDC? And what drew you to us? Y: I had never heard about VIDC until I saw the job posting, but I couldn’t stop myself from learning more about this center after discovering it! What drew me is their multidisciplinary and holistic approach to health care with a passionate team of health care professionals. I was captivated with their approach of non-judgmental patient care and research in such a balanced form in which both aspects are focused on but patient care takes utmost priority. The more I read about VIDC’s mission and initiatives, the more I visualized myself with the VIDC team and hoped to get the opportunity to contribute to their mission and advances in health care and research. What aspect/s of your role at VIDC are you most excited about? Y: My role at VIDC is of a Clinical Research Nurse, I will be closely working with clients for the treatment of Hepatitis C and HIV. I can’t begin to write what aspects of my role I am most excited about! There isn’t one aspect that I am any less excited about! This opportunity will allow me to further develop my nursing career to a whole new level, put me in the place to gain a lot of specialized knowledge about current and upcoming HCV and HIV studies, allow me to contribute to health care research and bring me one step closer to leading change as the health care field continues to grow with new discoveries in treatments and pharmaceuticals. Overall, it’s the journey of going from surgical nursing into clinical research nursing that I am most excited about. Now that that’s out of the way, let’s get to know the Yashna that’s not just a Clinical Research Nurse. What’s the ONE thing you can’t without? Y: I can’t live without education. I feel that there is so much in life that can be learned, and I wish that I could keep learning something new each day of my life. THREE things most people don’t know about you. Y: 1) I have a strong passion for dancing! I have gotten the chance to learn different forms of dances (Bollywood, Jazz, Salsa, Hip-Hop etc. ), do various stage performances as well as choreograph dances. 3) I am an extremely indecisive shopper! Sometimes I am more indecisive after buying something than I am before buying it. If you can only eat one meal, every day for the rest of your life, what would it be? Y: Fruits! I can live without protein but I can’t live without fruits! Do you have a motto or a personal mantra? Y: In my spare time, I love giving back to the community and supporting some of the causes I am most passionate about. Volunteering at the Canadian National Institute for the Blind and Canuck Place Hospice for Children is especially close to my heart and I like spending my spare time at these associations as much as possible. Y: I can’t stand people being arrogant. Lastly, do you have any hidden talents? Y: I write poetry! Due to my curiosity of interpreting poetry and its hidden metaphors, I began writing to express my inmost feelings. I experiment with various topics and forms such as: sonnet, ballad, lyric and free verse and incorporate them into my poetry portfolio. As you can see, at VIDC we are made up of a team of interdisciplinary individuals with diverse backgrounds. This — again like everything else we do — is to further our commitment to providing community-based holistic care for our patients. We are very different individuals working towards one goal! If you want to get to know her more, attend our Hepatitis C Treatment Support Group on Friday mornings!